Before we can go into development details, we need to discuss how to setup a comfortable development environment and what is the best way to contribute. To make a contribution to the repository your should fork the repository, clone your fork, and start development based on the master branch. Once you’re done, push your commits to your repository and submit a pull request for review. Once your contributions adhere to reviewer comments, your code will be included in the next release. To ease development and testing we provide a docker image containing all libraries needed to test all of scikit-multilearn codebase. It is an ubuntu based docker image with libraries that are very costly to compile such as python-graphtool. This docker image can be easily integrated with your PyCharm environment. This docker contains two python environments set for scikit-multilearn: 2.7 and 3.x, to use the first one run python2 and pip2, the second is available via python3 and pip3. $ docker exec -it scikit_multilearn_dev_test_docker bash -c "cd /home/python-dev/repo && jupyter notebook"
$ docker exec -it scikit_multilearn_dev_test_docker bash -c "cd /home/python-dev/repo/docs && make html"
One of the most comfortable ways to work on the library is to use Pycharm and its support for docker-contained interpreters, just configure access to the docker server, set it up in Pycharm, use niedakh/scikit-multilearn-dev:latest as the image name and set up relevant path mappings, voila - you can now use this environment for development, debugging and running tests within the IDE. has tests written, you can find relevant tests in skmultilearn.cluster.tests and skmultilearn.problem_transform.tests. One of the approaches to multi-label classification is to cluster the label space into subspaces and perform classification in smaller subproblems to reduce the risk of under/overfitting. In order to create your own label space clusterer you need to inherit :class:LabelSpaceClustererBase and implement the fit_predict(X, y) class method. Expect X and y to be sparse matrices, you and also use :func:skmultilearn.utils.get_matrix_in_format to convert to a desired matrix format. fit_predict(X, y) should return an array-like (preferably ndarray or at least a list) of n_clusters subarrays which contain lists of labels present in a given cluster. An example of a correct partition of five labels is: np.array([[0,1], [2,3,4]]) and of overlapping clusters: np.array([[0,1,2], [2,3,4]]). Let us look at a toy example, where a clusterer divides the label space based on how a given label’s ordinal divides modulo a given number of clusters. Such a clusterer can then be used with an ensemble classifier such as the LabelSpacePartitioningClassifier. Scikit-multilearn implements clusterers that are capable of infering label space clusters (in network science the word communities is used more often) from a graph/network depicting label relationships. These clusterers are further described in Label relations chapter of the user guide. To implement your own graph builder you need to subclass GraphBuilderBase and implement the transform function which should return a weighted (or not) adjacency matrix in the form of a dictionary, with keys (label1, label2) and values representing a weight. Let’s implement a simple graph builder which returns the correlations between labels. """Builds a graph with label correlations on edge weights"""
This adjacency matrix can be then used by a Label Graph clusterer. The clusterer can be then used with the LabelSpacePartitioning classifier. To implement a multi-label classifier you need to subclass a classifier base class. Currently, you can select of a few classifier base classes depending on which approach to multi-label classification you follow. Scikit-multilearn inheritance tree for the classifier is shown on the figure below. To implement a scikit-learn’s ecosystem compatible classifier, we need to subclass two classes from sklearn.base: BaseEstimator and ClassifierMixin. For that we provide :class:skmultilearn.base.MLClassifierBase base class. We further extend this class with properties specific to the problem transformation approach in multi-label classification in :class:skmultilearn.base.ProblemTransformationBase. The base estimator class from scikit is responsible for providing the ability of cloning classifiers, for example when multiple instances of the same classifier are needed for cross-validation performed using the CrossValidation class. The class provides two functions responsible for that: get_params, which fetches parameters from a classifier object and set_params, which sets params of the target clone. The params should also be acceptable by the constructor. This is an interface with a non-important method that allows different classes in scikit to detect that our classifier behaves as a classifier (i.e. implements fit/predict etc.) and provides certain kind of outputs. 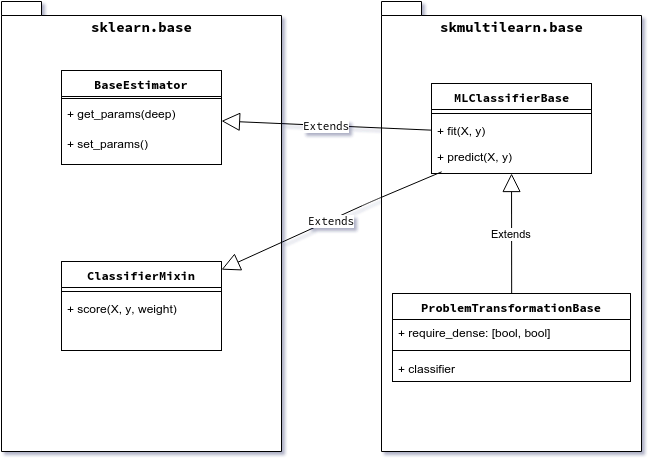 The base multi-label classifier in scikit-multilearn is :class:skmultilearn.base.MLClassifierBase. It provides two abstract methods: fit(X, y) to train the classifier and predict(X) to predict labels for a set of samples. These functions are expected from every classifier. It also provides a default implementation of get_params/set_params that works for multi-label classifiers. One of the most important concepts in scikit-learn’s BaseEstimator, is the concept of cloning. Scikit-learn provides a plethora of experiment performing methods, among others, cross-validation, which require the ability to clone a classifier. Scikit-multilearn’s base multi-label class - MLClassifierBase - provides infrastructure for automatic cloning support. X should be a sparse matrix of shape: (n_samples, n_features), although for compatibility reasons array of arrays and a dense matrix are supported. It should return self after the classifier has been fitted to training data. It is customary that fit should remember n_labels in a way. In practice we store n_labels as self.label_count in scikit-multilearn classifiers. The returned value is similar to y in fit. It should be a sparse binary indicator matrix of the shape (n_samples, n_labels). In some cases, while scikit continues to progress towards a complete switch to sparse matrices, it might be needed to convert the sparse matrix to a dense matrix or even array-like of array-likes. Such is the case for some scoring functions in scikit. This problem should go away in the future versions of scikit. The predict_proba(self, X) functions similarly but returns the likelihood of the label being correctly assigned to samples from X.
ensemble classification, when the multi-label classification is performed by an ensemble of multi-label classifiers to improve performance, overcome overfitting etc. In the case when your classifier concentrates on clustering the label space, you should use :class:LabelSpacePartitioningClassifier - which partitions a label space using a cluster class that implements the :class:LabelSpaceClustererBase interface. Problem transformation approach is centred around the idea of converting a multi-label problem into one or more single-label problems, which are usually solved by single- or multi-class classifiers. Scikit-learn is the de facto standard source of Python implementations of single-label classifiers. To perform the transformation, every problem transformation classifier needs a base classifier. As all classifiers that follow scikit-s BaseEstimator a clonable, scikit-multilearn’s base class for problem transformation classifiers requires an instance of a base classifier in initialization. Such an instance can be cloned if needed, and its parameters can be set up comfortably. The biggest problem with joining single-label scikit classifiers with multi-label classifiers is that there exists no way to learn whether a given scikit classifier accepts sparse matrices as input for fit/predict functions. For this reason ProblemTransformationBase requires another parameter - require_dense : [ bool, bool ] - a list/tuple of two boolean values. If the first one is true, that means the base classifier expects a dense (scikit-compatible array-like of array-likes) representation of the sample feature space X. If the second one is true - the target space y is passed to the base classifier as an array like of numbers. In case any of these are false - the arguments are passed as a sparse matrix. If the required_dense argument is not passed, it is set to [false, false] if a classifier inherits ::class::MLClassifierBase and to [true, true] as a fallback otherwise. In short, it assumes dense representation is required for base classifier if the base classifier is not a scikit-multilearn classifier. Ensemble classification is an approach of transforming a multi-label classification problem into a family (an ensemble) of multi-label subproblems. Scikit-multilearn provides a base unit test class for testing classifiers. Please check skmultilearn.tests.classifier_basetest for a general framework for testing the multi-label classifier.